“Budweiser Made In America,” the JAY Z-curated two-day music festival is adding a TIDAL Stage where nine (9) stellar TIDAL Rising and TIDAL Discovery artists, featured on the global music and entertainment platform, will perform each day beginning at 2:45pm. The artists are in addition to the already announced “Budweiser Made In America” lineup. 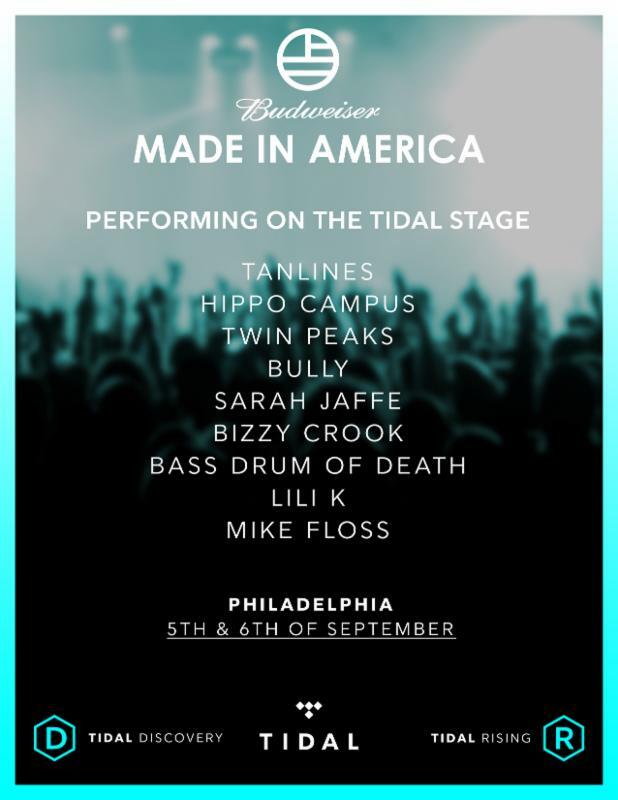 The “Budweiser Made In America,” concert will benefit United Ways in Greater Philadelphia and Southern New Jersey and Lancaster County, PA. A primary goal of this music festival is to have a positive impact on the communities involved and the money raised will be invested into these communities to positively impact the education, income and health of the most vulnerable and most needy citizens in these regions. The money raised from last year’s “Budweiser Made In America” festival allowed the United Way of Greater Philadelphia and Southern New Jersey to invest more than $300,000 into education and talent development initiatives, to enhance cradle-to-career education, equpping individuals with the job skills and training they need to secure a family-sustaining income. The festival also enabled United Way of Lancaster County to invest an additional $100,000 in programs and services in education, financial stability and health. Lili K: Hailing from Chicago, IL, classically trained vocalist Lili K was featured on Rolling Stone‘s “Best of 2013” list and received praise for her feature work with Chance the Rapper and Vic Mensa. Bizzy Crook: The Miami hip-hop artist draws his inspiration from Jadakiss, DMX, Ludacris and more. He has already been featured in XXL magazine and on BET. Bass Drum Of Death: From Oxford, MS, this rock group’s music has been featured in MLB2K12 and in the film “Ghost Rider: Spirit Of Vengeance.” Their latest album is entitled Rip This. Sarah Jaffe: This Denton, TX singer-songwriter just released her first EP entitled Even Born Again, and has received rave reviews from Rolling Stone,NPR and The Dallas Observer. She has previously toured with Norah Jones, Lou Barlow and Chelsea Wolfe. Mike Floss: The Tennessee native is rapidly expanding his audience with his last two releases For The Rebels 1 & 2, that were recognized by Nashville Scene as Mixtape and Hip Hop Album Of The Year respectively. He has opened for Pusha T, Wale, Stalley and Yo Gotti, among others. Twin Peaks: The rock band recorded their debut album in 2012 and their newest release Wild Onion in 2014. Their sound is influenced by acts such as The Strokes and Ty Segall. Hippo Campus: Gearing up for their tour in early 2016, the group from Woodbury, MN, recently released their album Bashful Creatures online, CD and vinyl. Bully: Currently touring the US, this Nashville-based group recently released their album Feels Like this year. Since 1996, 21-time GRAMMY award-winner, Shawn “JAY Z” Carter has been a dominant force in popular culture. With multiple businesses and accolades across the recording industry and strong relationships with global investment leaders like Warren Buffet, JAY Z personifies the “American Dream.” Among his achievements, Carter has served as President of Def Jam Recordings, launched the successful “Made In America” festival and acquired luxury spirits brand Armand De Brignac. In 2013, Carter launched Roc Nation Sports, whose roster includes three-time NBA scoring champion and Oklahoma City Thunder star Kevin Durant and MLB All-Star Seattle Mariners second baseman Robinson Cano. Budweiser, an American-style lager, was introduced in 1876 when company founder Adolphus Busch set out to create the United States’ first truly national beer brand – brewed to be universally popular and transcend regional tastes. Each batch of Budweiser follows the same family recipe used by five generations of Busch family brewmasters. Budweiser is a medium-bodied, flavorful, crisp and pure beer with blended layers of premium American and European hop aromas, brewed for the perfect balance of flavor and refreshment. Budweiser is made using time-honored methods including “kraeusening” for natural carbonation and Beechwood aging, which results in unparalleled balance and character.